Turmeric is probably one of the most potent spices ever. It has so many health benefits. Turmeric has been used in Chinese and Ayurvedic medicine for thousands of years. If I had to pick one spice that offered more health benefits over all others, it would definitely be turmeric. Turmeric is a member of the ginger family and the healing properties of this plant are in its stalk. The most important compound found in turmeric is called curcumin. In Ayurvedic medicine, turmeric has been used to treat arthritis because of its anti-inflammatory properties. It is also used to treat muscle pain and carpal tunnel syndrome, liver problems, wounds, digestive problems, mouth lesions and skin diseases. A study at the Medical University Graz in Austria showed that curcumin delays liver damage. Kansas State University researchers found that it can reduce levels of carcinogens that are formed when meats are fried, barbecued or fried up to 40%. Studies conducted at University of Texas indicated that curcumin inhibits the growth of melanoma and also slows the spread of breast cancer to lungs. UCLA studied curcumin in the mouths of patients that had neck and head malignancies and it showed to reduce activities that promote cancer growth. It also affected the salvia itself by reducing pro-inflammatory cytokines within the saliva. James A. Duke, PhD, a respected ethnobotanist, found more than 50 studies on turmeric’s effects in addressing Alzheimer’s disease. The reports indicate that extracts of turmeric contains natural agents that block the formation of beta-amyloid, the substance responsible for the plaques in Alzheimer’s disease. Duke reported in the handbook Phytochemicals: Mechanisms of Action, that curcumin and/or turmeric were effective in animal models in prevention and/or treatment of colon cancer, mammary cancer, prostate cancer, murine hepatocarcinogenesis (liver cancer in rats), esophageal cancer, and oral cancer. Duke said that the effectiveness of the herb against these cancers compared favorably with that reported for pharmaceuticals. Dr Merina Benny Anthony, PHD, Dept. of Biochemistry University Centre, Kariavattom, found that curcumin has been shown to inhibit the estrogen mimicking pesticide recedues in the water, food, fruits, milk, vegetables etc. Professor Moolky Nagabhushan, of Loyola University Medical Centre in Chicago, said turmeric blocks some of the harmful effects of cigarette smoke, protects against chromosome damage and prevents dangerous chemicals forming after eating processed food. Turmeric is also used in bridal beautification ceremonies in India, Bangladesh and Pakistan. It is used as part of the marriage ritual. On the wedding day, the string of the Thali necklace (mangalsutra), which is the equivalent of a wedding ring, is prepared in turmeric paste, dried and then tied around the bride’s neck by the groom. In the palaces of Central Java, Indonesia, the root was used during Lulur, an ancient royal ceremony for the bride-to-be, in a ritual to cleanse the body and give it a radiant glow. Hindu brides-to-be rub a mixture of turmeric and gram flour on their bodies on the morning of their wedding to give the skin a golden glow. There are many recipes online for a do it yourself facial using turmeric. The most common recipe calls for turmeric, milk and white flour. I made mine using turmeric, rice flour and almond milk. I have to admit the first time I used it, I was panicking! A little scrubbing was required to get the yellow stain off of my face in some places. Afterwards I noticed that my face was softer and had a glow about it. I use turmeric in my facials often. Turmeric is also used as a treatment for acne, blemishes, wrinkles, eczema, psoriasis and facial hair. 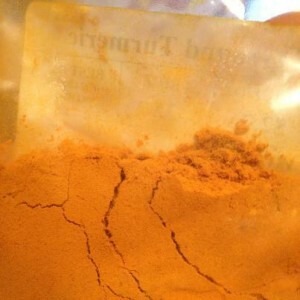 I like to add a spoon of turmeric to tomato based soups and sauces, it gives it a warm, buttery, creamy flavor. It’s also great sprinkled on salads and vegetables.